"The scene pictured here occurred at a time when Minamoto no Yoshitsune and his half-brother, Yoritomo, had become sworn enemies. Tosabō Shōshun, a vassal of Yoritomo, had gone to Horikawa to spy on and possibly attack Yoshitsune and his encampment. There are two parts to the tale regarding Tosabō's mission. During the day, Yoshitsune's retainer Benkei intercepted Tosabō and brought him before Yoshitsune at his residence in Horikawa, whereupon Tosabō, who pretended to be merely a pilgrim on his way to Kumano, was whipped before being sent back to his master Yoritomo. Having observed the defenses at Horikawa, Tosabō returned that night with his soldiers to attack Yoshitsune. They were then captured - this is the scene represented here. Tosabō was able to escape but was re-captured, led to Rokujōgawara, where he was then killed. 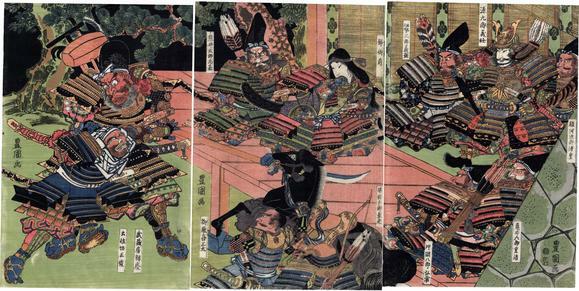 Yoshitsune, his mistress Shizuka Gozen and his vassals, including Kumai Tarō and Ise no Saburō, look on when Tosabō is brought back a second time. Toyokuni's use of the triptych form is particularly masterful here. The viewer is drawn first to Benkei and Tosabō in the left-hand sheet, before moving towards Shizuka Gozen seated at the back of the centre sheet; identifiable by his elaborate kabuto, Yoshitsune sits in the background to the far right, calmly and somewhat aloofly inspecting the altercation. Unlike their master, the warriors in attendance - at the top and bottom of the viewing area - express differing degrees of agitation. With the exception of Yoshitsune and Gozen, Toyokuni uses cariacature in his delineation of all the figures, especially Benkei and Tosabō. In striking contrast, the features of Yoshitsune and his mistress are refined and rendered without colour. However, the strength of this work resides in the grappling on the left sheet between Benkei and Tosabō. The names listed on the print include (right sheet): Suruga no Jirō Kiyoshige, Genkurō Yoshitsune, Ise no Saburō Yoshimori (upper part), Kamei Rokurō Shigekiyo, Kataoka Hachirō Hirotsune (lower part); (centre sheet): Shizuka Gozen, Kumai Tarō Tadamoto (upper part), Hori Yatarō Kagemitsu, Oumaya Kisanta (lower part); (left sheet): Musashibō Benkei and Tosabō Shōshun." Quoted from: Japanese Warrior Prints 1646-1905 by James King and Yuriko Iwakiri, pp. 174-75. Illustrated in color at the bottom of both pages. The cartouche in the lower right reads: 亀井六郎重清 (Kamei Rokurō Shigekiyo) This figure appears in at least two different compositions in the Lyon Collection. The other one is in a triptych by Kuniyoshi of Kamei Rokurō fighting with a bear. See #228. The figure to our left of him is 片岡八郎弘常 (Kataoka Hachirō HIrotsune). The name in the white cartouche along the left-hand side of the triptych is 駿河次郎清重 (Suruga no Jirō Kiyoshige).